The skills and benefits of being part of a roller derby league. Roller derby teaches people how to work together, how to help one another, how to be strategic, how to be healthier, how to be strong (in many ways), how to have fun. 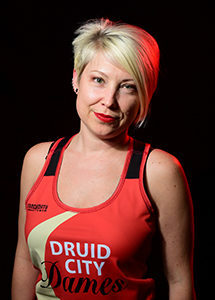 Roller derby is known for building confidence – notably in women. The camaraderie established by women within roller derby communities is the strongest I’ve ever witnessed. I am a native of Tuscaloosa, Alabama – growing up in a more rural area on the outskirts. My husband and I have a 17-year-old son in his senior year of high school and a 26-year-old son recently returning from China and residing in Louisville, Kentucky. We have three dogs, two cats, and both work at The University of Alabama. I have an associates degree in graphic design and prepress communication, a Bachelor of Science in Science, Technology, and Culture and I am currently a part of the Masters program in Interactive Technology at UA. I work as a Project Administrator in the College of Continuing Studies. I manage projects spanning the entire college including at the Bryant Conference Center and Bryant Museum. 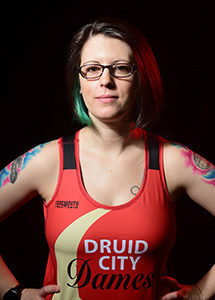 I am a founder and coach for Tuscaloosa’s one-and-only roller derby team, the Druid City Dames. 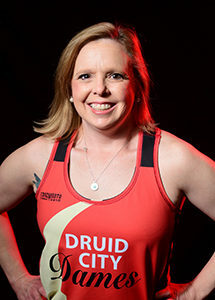 I have been a part of the Board of Directors, sitting as the VP for the non-profit Druid City Derby, for over 3 years. I enjoy the company of these strong women and athletes. While I lack a lot of spare time, I do enjoy cooking, singing, and relaxing with family and friends or simply on the couch with my favorite partner. DCD is growing! And that is so cool! The league has an awesome opportunity to do great things in Tuscaloosa!